​​﻿The Wendel Center for Art Education, known popularly as "daco studio," is a two-story, 2,500 square-foot structure built to replace the original carriage house in 1916. A large professional studio on the first floor provides space for art students of all ages. A family center is located upstairs in the studio, where parents and grandparents can work and play with their children. Our Fiber studio is located on the second floor with looms, sewing machines, and all things fiber related. The redesign of the Education Program at the Decorative Arts Center of Ohio is in response to a changing community and a desire to remain relevant to our community. The redesign includes some old favorites, new days and times for new classes, longer sessions for the more serious art student, master classes, workshops, and lectures. 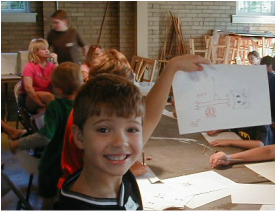 The mission of the Decorative Arts Center of Ohio is to engage our community through innovative, stimulating exhibitions; to deliver an arts education curriculum that unleashes possibility and imagination; to preserve and showcase the architecture and collection entrusted to our care. Lisa Schorr was born and raised in Lancaster.Growing up in a rural setting fueled her love of nature and being an only child gave way to a deep connection to and love of animals. Using her art, she enjoys expressing her intuitive understanding of animals and nature and the ways we relate and interact. Lisa has always had a need and a great desire to create. Like most artists, she likes trying new media including metal, clay, and textiles, but she usually returns to the paint and brush, the true north of her art spirit. Lisa has forged a continuing education in art on her own, reading, researching, and creating art each and every day. She is currently learning French and planning a trip to France to paint and absorb as much French culture as she can. You just might find some influence of her new obsession in her newest art. Each day is an opportunity to continue on her art journey and it's always interesting. ​Barbara Ery is a multimedia artist whose work incorporates painting, fabric, paper mache, and photography. She has a BFA from Ohio University, and is a retired special needs teacher. Barbara is not only sharing her talents with the Decorative Arts Center of Ohio, but also with other local organizations including VSA, an international organization whose focus is on education, arts and disability, and the Women of Appalachia Project, a group of Appalachia’s finest visual, literary and performing women artists. Mary Jeanne Goss is a textile artist specializing in weaving and spinning. She graduated from The Ohio State University in 1977 with a degree in Art Education and a minor in Weaving before going on to get a Masters in Library Science at San Jose State University. While attending Ohio State, she studied under the master weaver Clara Creager. Her focus in weaving has been rugs and pattern weaving, as she especially enjoys creating textiles for decorating her home. Mary Jeanne has a weaving studio filled with looms including tape looms, inkle looms, a tapestry loom, table looms, and several floor looms, along with a collection of spinning wheels that vary from a large antique walking wheel to a modern Hansen mini-spinner. The textile arts have been a hobby and passion for 40 years. Mary Jeanne is a retired Media Specialist from Berne Union Local Schools, where she taught and ran the Media Center for 15 years. During her years at Berne Union, she taught classes on Media and Tech Art, dedicated to art and computers. ​A Lancaster native, Anne Hart Kiphen is a graduate of Ohio Dominican University, where she majored in Art and minored in Music. She did further Art studies at Ohio University and Miami University. Anne taught Art in the Bloom-Carroll School District for 30 years. She is currently Art Director at the Ohio Glass Museum, where she has served for 12 years. She sings with many groups in the area. Anne and her husband, Myles, have 2 daughters and 4 grandchildren. ​Dallas Rienschield is an Ohio based artist specializing in multimedia design. She received her BA from Ohio University, with a focus in painting and print making. Dallas currently resides in Lancaster, Ohio where she is lovingly involved with the local art community. Bianca Gery is a professional artist, specializing in abstract art and design. She has a B.A. in Studio Art and a certificate in Women's, Gender, and Sexuality Studies from Ohio University. Bianca is the owner of B. Sage Studios, a traveling company focusing on artisan jewelry and decor. She enjoys experimenting with everything from painting and soft sculpture to graphics and photography, all while incorporating ideas of identity, evolution, and fantasy into her work. Bianca currently lives in Canal Winchester with her husband and two cats. Daniel J. King, an Ohio-based artist/educator, makes photographs, and video projects dealing with the human relationship to geography, memory and place. Daniel has a B.F.A. in Photography and Media Studies from Columbus College of Art and Design, and an M.F.A. in Photography and Integrated Media at Ohio University, and has recently relocated to Lancaster, Ohio. He has exhibited photographs, books, mail-art projects, and video in exhibitions festival screenings nationally and internationally. ​Dayton Willison has been a professional theatre artist for the past 5 years. He has served in many different aspects including Costuming, Acting, Puppetry, Teaching, Props, and other areas. He recently taught Movie Making Summer Camp at the Decorative Arts Center along with teaching several CATCO summer camps as well. Dayton has a Bachelors in Theatre and Marketing from Ohio University and an Associates from Hocking College in Theatre. Dayton loves working in all areas of the theatre.